Properties in Spoleto Station average 4.8 out of 5 stars. A lovely agri-tourism development set among the green hills. Property 6: A lovely agri-tourism development set among the green hills. After 5 days in Rome we spent 3 days in Umbria with Capoccia Carola. We've been to Umbria several times before and this was the best spot so far. Apartment was immaculate, everything worked fine, beautiful location and convenient to all the places and things we wanted to do. We were at the end of October so didn't take advantage of the outdoor pool and other facilities. This would be a great place if you had children but we found it perfect for us 3 adults. Coffee, wine and an informal restaurant with surprisingly good food were all within a 500 meter walk although not visible from the privacy of the apartment itself. Loved it and highly recommend. From the moment we arrived until the time we left Paolo helped to make our trip to Umbria an experience to remember. Paolo has taken an centuries old hill top villa and turned it into modern suites while maintaining the charm of the building and the property. Our room was clean, modern and tastefully decorated.There are many excellent restaurants within easy driving distance. 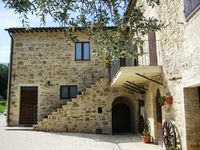 Paolo is a gracious host and is responsive to his guests' needs, ranging from places to visit or reservations for local restaurants to enjoy Umbrian cooking. After dinner you can sit on the front lawn of the property and enjoy an amazing view of the surrounding hills and Assisi across the valley while you enjoy a glass of Paolo's excellent wine. WE RECOMMEND THIS PROPERTY AND LOOK FORWARD TO OUR NEXT VISIT.